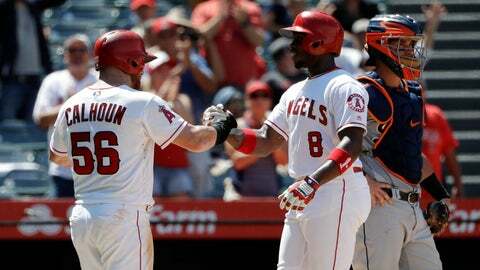 ANAHEIM, Calif. (AP) — After getting three big homers and nine innings of outstanding pitching to complete a series sweep, the Los Angeles Angels are headed into a day off with a rare feeling of contentment in their disappointing season. Mike Trout missed his seventh consecutive game with a sore right wrist, but the Angels still scored 23 runs in the three-game series without their best player. “Obviously you never want to play many games without a guy like Mike in our lineup, but I think we’re holding our own,” Angels manager Mike Scioscia said. Starting with three strikeouts in the first inning, Barria had another effective outing for the Angels, who have benefited greatly from his surprising emergence as a dependable starter in their injury-plagued rotation. He struck out five in total and walked one before leaving with two outs in the sixth. The Angels bullpen then got 10 consecutive outs to finish it. Jefry Marte had an RBI single in the first inning, and he doubled and scored on Jose Briceno’s single in the sixth. Calhoun led off for the Angels with his 15th homer. The blast was the ninth leadoff homer by Calhoun, who endured a miserable first half of the season before finding his stride since coming off the disabled list June 18. He has hit 14 homers since that DL stint, tops in the AL during that stretch. The Angels got more good news when Scioscia said he’s optimistic Trout could play Friday against the Oakland Athletics. Trout’s wrist has kept him out for the second-longest injury absence of his big-league career, but he will come in Thursday on the Angels’ day off to throw and perhaps to swing a bat. Shohei Ohtani had the day off after homering Tuesday night as the Angels’ designated hitter. Ohtani frequently sits against left-handed starting pitchers such as Hardy. The Tigers haven’t won a series at Angel Stadium since August 2009, and they’ve lost 24 of their past 31 games in Anaheim. They’ve also lost 31 of their 43 meetings overall with the Angels since September 2012. Tigers: Catcher John Hicks went on the 10-day disabled list with a right groin strain. The move was retroactive to Tuesday. Detroit recalled catcher Grayson Greiner from Triple-A Toledo to back up James McCann. Angels: Manager Mike Scioscia is still hoping Tyler Skaggs can start Saturday against Oakland after coming off the 10-day disabled list. Skaggs went on the DL last weekend with a left adductor strain, but the move was retroactive to his previous start. Tigers: After a day off, Jordan Zimmermann (4-4, 4.31 ERA) makes his 16th start of the season in the opener of a home series against Minnesota. Angels: After a day off, converted reliever Felix Pena (1-3, 4.97 ERA) makes his ninth start of the season Friday at home against Oakland. Pena has been a solid stopgap for the Halos’ troubled rotation. He took a no-hitter into the sixth inning in Cleveland last weekend, but still took the loss.